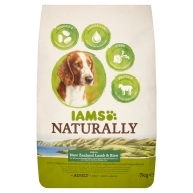 IAMS Naturally North Atlantic Salmon & Rice dry dog food provides your dog with a 100% complete and balanced meal. 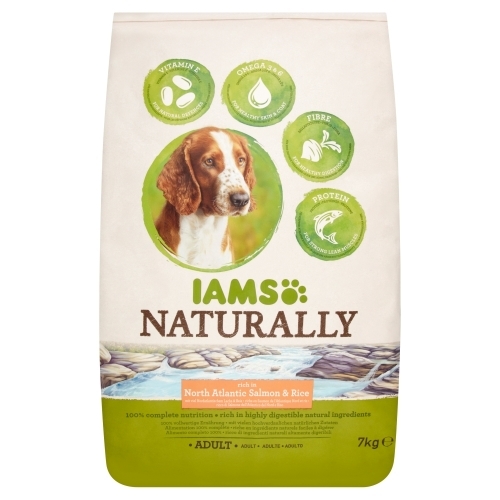 Made with highly digestible and natural ingredients, each mouthful is bursting with nutrition, ensuring your dog is visibly healthy, strong and happy. 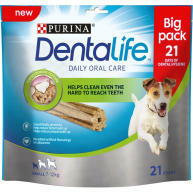 •	Contains Omega 3 & 6 oils, these keep the skin healthy and helps to produce a glossy, healthy coat. 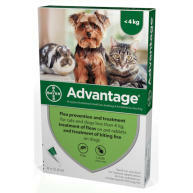 •	Rich in fibre for an effective digestive system. •	High levels of protein for strong and lean muscles. •	Supports his natural defences through vitamin E.
Dried Chicken and Turkey, salmon (14%), rice (14%), maize, sorghum, barley, dried whole egg, dried beet pulp (2.6%), maize oil, hydrolised animal proteins, animal fat, potassium chloride, sodium chloride, sodium hexametaphosphate, fructooligosaccharides 0.26%), calcium carbonate.